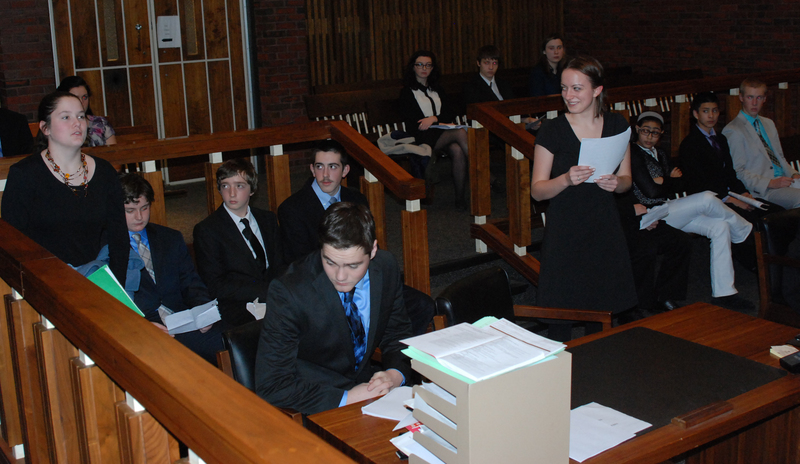 This year, the RHS Mock Trial team made history as they won their first meet ever on Feb. 27 at Braintree High School. The team participated in their last two meets of the year the last week of February. The first meet took place on Wednesday, Feb. 25 at the Brockton District Court, and the second, and last meet of the year, took place two days later at Braintree High School, where Rockland won by two points. Mock trial is a club devoted to immersing students into a courthouse environment, and putting them in a simulation of real courtroom procedures and trials. In this environment, teams will pose as either the defense or prosecution, and each team’s members will be either a witness, or an attorney. The teams will then simulate a real court case, and defend their argument. In mock trial, whether the verdict is in favor of the defense or the prosecution, this does not mean that that team has won. The winning team is decided by who receives more points. A team’s score is calculated from the sum of the individual team member’s collective scores. This is decided by knowledge of their position, content, and presentation, which based on their performance, can give them a score between 1 to 10. This year’s case, depending on whether you were the defense or prosecution, involved an incident in which either: a kind grandmother feared for her, and her grandchildren’s safety, and shot the bat-wielding, aggressive son-in-law, ending his life, or a lonely, emotionally unstable grandparent fired at and killed her son-in-law in order to win a custody battle over her grandchild, his daughter. This is how either side would argue their case. The judge decides whether the grandparent’s actions were second degree murder, self-defense, or anything in between the two. Despite the exemplary performance of the Rockland Mock Trial team, the group lost by a score of 70 to 79 against Spellman. But two days later, the team faced Braintree, and won by a score of 70 to 72, winning the first Mock Trial meet in Rockland history, ending the season on a pleasant note. 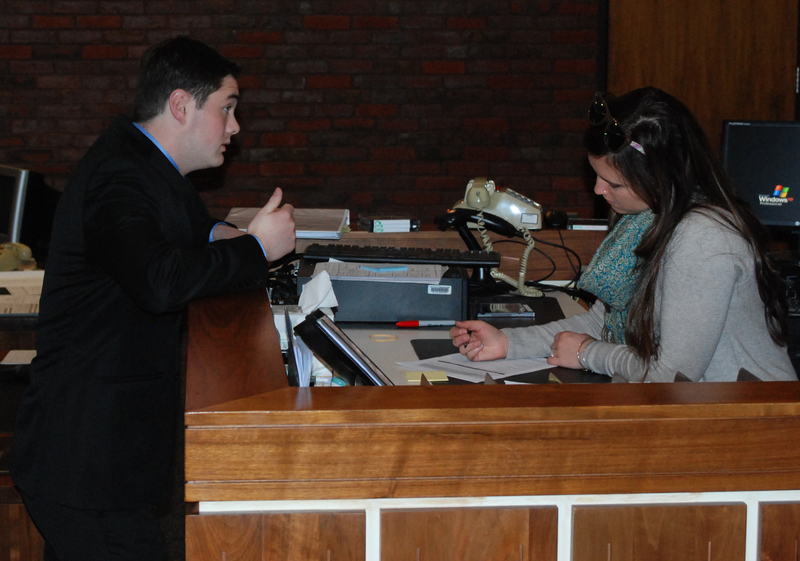 Senior Pearse McNally confers with Mock Trial Advisor, Ms. Lanigan. Mock trial members that stand out in this club include Pearse McNally, PJ Butler, and Dennis McPeck, all of whom are graduating this year, and therefore, have finished their participation in mock trial. “They played a pivotal role in taking the mock trial team and making it what it is. [They] have dedicated their time to this team, and the improvements they’ve made to it is evidence of this,” said Social Studies teacher, Amanda Lanigan who, along with Social Studies Coordinator, Randall Grimmett advises the team. Could this victory be a sign for future meets to come? Time will tell. But in the time between now, and the start of the next season, why not consider becoming a member of the RHS mock trial team?